When Amy's parents are chosen to travel aboard the Godspeed, the largest spaceship ever built, to colonize a new planet, they know it's a huge honor. The only catch? They have to submit themselves to being cryogenically frozen so that they can arrive unscathed—three hundred years in the future. Despite the uncertainty and pain, Amy joins her parents, expecting to be woken up when they arrive. Only, when she does awake, it's to pain and confusion. Someone has unplugged her fifty years too early, seemingly with the intent to kill her, and it continues to happen to others. Amy must become accustomed to a ship run by the questionable Eldest and his apprentice Elder and their foreign methods of control. But Amy isn't like the ship's inhabitants...she's not gullible, and she knows that something is seriously wrong on the Godspeed. But can she figure out what it is before someone she knows and cares about is unplugged? 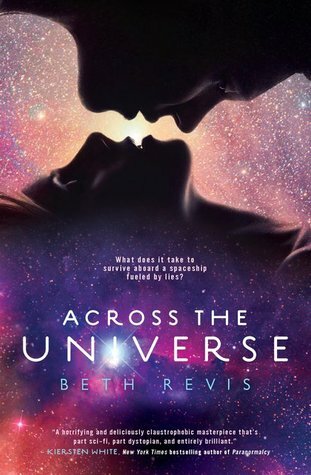 Across the Universe is a fascinating and tense read and Revis snags your attention from the very beginning with her detailed and unflinching descriptions of the cryogenic freezing process and Amy's conflict over her agonizing decision. The book bounces back and forth between Amy and Elder's points of view, even while Amy is still frozen, which helps give the reader a greater view of the world inside the Godspeed and helps the reader to understand Elder's background and life, which is far different from ours. The book is well-paced and moves quickly despite its length, and the many little mysteries make for one compelling plot. Some are easy to figure out, but Revis does manage to throw in a couple of real surprises as the book unfolds. She writes some really excellent, tense, fearful scenes that will have you cringing, but she also demonstrated the desperation of being trapped on the ship in other more subtle ways, like in the character of Harley. Telling the truth, no matter what the cost or consequences, is a strong message in Across the Universe, even up until the shocking end, which will leave you thinking about the Godspeed for quite a while. Cover Comments: The cover I have posted above is just gorgeous. I love the stars and the use of the light and all of the different shades of color--it's breathtaking! And the silhouettes are perfect--it gives you the feeling of being connected over great periods of time, which Elder and Amy are. However, it's a very romantic cover for a book that will greatly appeal to guys as well, which is why it is being published with a reversible cover...which, unfortunately, I couldn't find a picture of...but it is neat as well, just not as cool as this one, in my humble opinion! Across the Universe will be available on January 11th, 2011! Been hearing a lot of buzz about this one. Looking forward to reading it. Thanks for the review. I have this one on my tbr and it's coming up fast. Looks like I'll enjoy it. I'm curious about that reversible cover. I love the cover you posted. I'm glad to hear you liked this one and that it is well-paced. Do you know if it is a standalone? You know, the ending was kind of final, but it also left room for perhaps some sort of companion. Plus, it's always possible...if this one does well, maybe there will be another. First, thank you for such a great review--and I'm so glad that you picked up on the theme of truth in the novel. That's so important to me. I don't get why it has the same cover as the across the universe movie. I know the're not related though. Oh, I love the cover too! And it looks really cool read. impressive choice - I have to check it.